On Thursday morning, Cheese Puff finished his breakfast early. Little Elvis hadn't, and Cheese Puff was apparently still hungry. I turned around to see Little Elvis feeding some of his dry cereal, piece by piece. It was so cute! But by the time, I got my camera, Little Elvis was onto me. He turned around so he could pose. But it was still really cute, even when he was trying to force-feed Cheese Puff. Poor Cheese Puff. I tried to put away all of our winter clothes two weeks ago, because it was pretty that day. I had a bag of slightly outgrown winter clothes for him, and it was easier to get into. Around the house, he's been wearing clothes that really don't fit. He doesn't seem to mind. When going out, he has three outfits I've dug out. His brothers are in the same boat. They've been wearing the 3-4 long sleeved tees I left out. I guess I won't switch clothes out so early next year. Cheese Puff's getting sick again. I fed him spaghetti for lunch yesterday. Bob doesn't think that's it, because he's eaten other tomato-y things this week. He was very tired, because he only wanted to sleep on me, and I wanted him to sleep in his bed. But that's kind of most days. We battle him sleeping by himself a lot, and my will falters when he's throwing up. He's still coughing, although he wasn't yesterday when he got sick. Twice, the boys had to tell me he had thrown up somewhere, because I didn't even realize he had -- one of those times I was holding him, and it was on both of us. I called the doctor back, and spoke to a different nurse. He's now got an appointment for Monday. I am almost certain it's another ear infection. He was treated for one right before he turned one. At his one year check up, it wasn't fully gone. I think it's come back. Maybe that's the cause of all of his problems. That, or he's got a very easy to trigger gag reflex. Yesterday, before he got sick, we went to Little Elvis' egg hunt. I forgot my camera. I've got some cute cell phone pictures, but can't upload them yet. Cheese Puff was in his stroller, and was so patient with all the little boys getting in his face, and talking with him. Baby Plum wasn't sure what to do with himself, and he kept hugging and trying to lay on Cheese Puff. Sometimes, he'd try to sit in Cheese Puff's lap. Cheese Puff was fine through all of it -- very mellow. The boys are liking Easter. The candy is fun. Hunting for eggs is fun. And they even enjoyed coloring some the other night. We boiled 7 and did 4 colors. They picked the colors, and then attempted to do the coloring. Baby Plum's chocolate goatee? He went to a birthday party that afternoon, and really enjoyed the goody bag on the way home. They had hand painting at the party, and he picked Cookie Monster. Naturally. His pre-school had its Easter Party this morning. They had a bouncy castle. He only went down the slide twice -- standing in line isn't his strong suit. But he had a blast when he did. I had a devil of a time getting him going down the slide. I'd watch him get close to the little ladder, and run around to watch him slide, only to see every other kid slide. He would forget, and get out of line. Silly boy. He seemed to play with one boy a little bit, which was cute. His teacher said he's talking more in class, and isn't as shy as we thought. I think he just has to warm up to people and places. Cheese Puff couldn't get in the bouncy castle. I was worried the older kids would hurt him. He did pick another mom to hold him. He just reached for her, and was thrilled to be held by someone else. Thankfully, her daughter didn't mind. Some of my friends have kids that get jealous when they hold Cheese Puff. Baby Plum hunting for Easter Eggs. He was happy to share the wealth with Cheese Puff. He gave Cheese Puff a chocolate kiss. I think our little Kissy-face has a new favorite type of kiss. and stole some Goldfish. Baby Plum was fine with it. I'm glad Cheese Puff only took from Baby Plum. The teacher got an extra cookie out for my little snack thief. She was going to get him more, but I told her that a cookie should be plenty. It was Cheese Puff's first iced cookie, too. I think he's going to be a big fan of class parties from now on. Which is good, because we have Little Elvis' party tomorrow. I know this is a lot of pictures for a pre-school party, but I was feeling guilty. Our church had its Easter hunt on Sunday, and I forgot our camera. Baby Plum has lovies. He has his thumb, which is his favorite lovey. He also has a very ratty blanket that used to be mine that he likes to sleep with. Then there's froggy. Santa brought him Froggy for Christmas 2011. Santa bought him on clearance at Sam's right before Christmas Eve. Baby Plum had been eyeing the St. Jude stuffies, and seemed to favor the frogs. On Christmas morning, he wanted to take Froggy to church. Then he left it at the front of the pulpit after the preacher blessed it. He forgot about Froggy for about a month, then he remembered him. Since then, Froggy has become a nighttime staple. In the past couple of weeks, Froggy has been venturing out of the bedroom. He went to the zoo, and he's been playing with us in the playroom. Froggy's also had some surgeries. I'm fairly certain these toys weren't meant for this type of love. I just thought this was a cute picture of our little shy guy. I call him my helper, and will tell people he's the helpful one (I know I shouldn't) but he has heard me, and is very proud of this title. Baby Plum will tell people this... when he talks to them. Baby Plum is definitely shy. He doesn't talk in school, or at birthday parties, or in Sunday School. He will if Little Elvis is around, though. Little Elvis makes him brave. It's been several days since sweet little Cheese Puff has thrown up. Not quite a week. But we're thrilled that he hasn't gotten sick since Thursday. Not only that, his little appetite has come back. We've gone back to feeding him 3rd food jars. He doesn't like table food. This is also the look that we get when we tried to feed him any type of dairy. So far, he's not a fan. Not a fan at all. We've tried whole and 2% milk, greek yogurt, baby yogurt, cheese, smoothies, etc. He's not having any of it. I read somewhere that babies have to try something 22 times before they accept it. He LOVES sweet potatoes, though. Does he look like anyone here? This little expression with the chubby cheeks and mischievous grin makes me think of Baby Plum. This isn't the best picture. I need to find one of a 13 month old Baby Plum. But it's late. I'm tired. What a funny shot. They both look confused and skeptical. I feel like that sometimes. Maybe more confused. I don't know which boy looks more like the other. At this point, I think Cheese Puff looks more like Little Elvis. But I'm not positive. My grandmother says that none of the boys look alike at all. But once we cut Baby Plum's hair, lots of people thought he looked just like Little Elvis. Little Elvis' speech teacher thinks Cheese Puff looks like Little Elvis. Baby Plum's speech teacher thinks Cheese Puff looks just like Baby Plum. The director of the speech place thinks they all look just alike. Can you believe they went to school in short sleeves last week? It snowed some last night. Maybe 2 minutes worth. Anyway, I know they don't look just alike. But they do have the same hair color, same eye color (the oldest 2) and same nose (all of them.) They're also all pretty sweet, though in very different ways. We were able to have a little fun on Spring Break, and escape the stink of our house. My mom got us a night at a hotel with an indoor pool at the big city. Not only did it have a cool pool, it also had a little lake with koi and ducks. I thought Baby Plum was confused when he told me there were ducks, but there really were cute little ducks. Here are all of my boys, and Froggy. This was right before we left the hotel. The breakfast was great for most of us, but Cheese Puff wasn't interested in any of it. He still wasn't right that morning, and we had a hard time getting him to drink anything, even straight juice. I tried to get a shot of the fish. There were some huge fish that probably would have showed up better. The ducks would have shown up better. Instead, I snapped a shot of a fish that was about the color of the rocks. Baby Plum tried to help find a good fish. He's the one pointing in the corner. The boys have to play with one of the concrete animals at the entrance to the zoo. Our little snake fan got to pet an Appalachacola snake. Last summer, he couldn't get enough snake stuff. That morning, he kind of petted it, found out the name, and then moved on. He just wasn't interested at all. Bob talked to the women showing the snake to find out what they studied in school, just in case the snake fever hits again. I am fine if Little Elvis moves on from this phase. Little Elvis was much more interested in the Iron Man action figure he bought with his money at Target. It's an action figure, not a doll. He had to take Iron Man to the zoo, so Baby Plum had to take Froggy. Froggy has been Baby Plum's night-time bestie since last Christmas. This was Froggy's first trip to an actual place. Both boys did a great job keeping up with their buddies. This is major backlog picture catch up. I've not logged onto my computer recently, and it's what I use to do pictures. On the very first day of Spring Break -- the first Friday -- Bob took the older two boys to listen to a guy talk about gravity and astronomy. That left me with Cheese Puff. 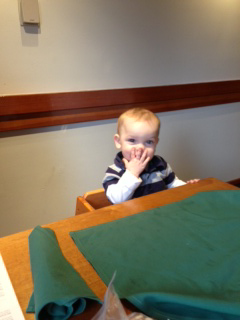 My parents took us out to eat, and he had a blast at the restaurant. He's becoming quite the little flirt. He's really into blowing kisses these days. And just kissing in general. Bob and I get lots and lots of kisses everyday. Little Elvis is a big kisser, but Cheese Puff looks like he'll be an even bigger kisser. He wanted to try my ice water. It was a little too cold. 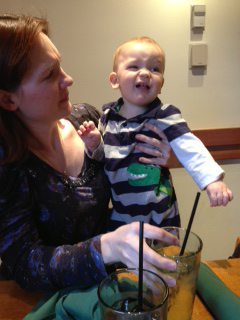 But he kept taking more sips, just to make sure he didn't like it. His pregnancy was the only one where I didn't want to eat ice all of the time. I guess I shouldn't have been surprised. His brothers both like my super-iced water. For the most part, we think our two older boys are better. Kind of. We decided to take a little trip to the big city yesterday. Baby Plum got sick at a restaurant. Cheese Puff got sick at the hotel. But then they were fine. I think Baby Plum was trying to prove he didn't like black beans, and it just kind of got away from him. But Cheese Puff wasn't. We've called the doctor. He's been getting sick every night at about the same time since Sunday. He's fine. Then he's sick. Then he's fine. He's eating foods that he's been eating for a while. Typically, these episodes happen during nursing. Could I suddenly be making him sick? We're in the weaning process. The doctor said it could be acid reflux. He's been really stuffy, so it could also be mucus. She also said it could be left over virus stuff. Last night, he decided he didn't want to drink anything. All day today, we tried to get him to drink, and he barely did. Finally, he did drink a little this evening. And right before he gets sick, his little tummy gets so tight. Today, he threw up at Sam's this afternoon. He had just eaten a strawberry. Then he threw up twice this evening. I'm starting to get worried. The doctor said to call back on Monday if he was still not doing well, but I may not be able to wait that long. Oh, I hope the sickness is over. It's Spring Break for our area. So, all of us are home. And the three youngest ones have been sick. It's not been fun. It started with Cheese Puff. Then hit Baby Plum while Cheese Puff still had one episode. And Little Elvis joined in on the fun late last night. With three, you definitely notice all of the laundry. I am ALWAYS putting clothes away. You notice the fingernail cutting. But having three sick at the same time? That's definitely been the worst. I was done last night after the umpteenth time being spit up on. I hit my max. I was tired of the stink, the sounds, the pain of the little boys crying while being sick. We took it easy today, but I'm still convinced the house stinks. Bob can't smell it, but I can. We've scrubbed and steamed the carpet. We've washed lots of loads of clothes. We've scrubbed walls, toys and toilets. I washed one couch cushion. But it still smells. We've even Febreeze'd, which I'd rather not do. Hopefully, the worst is over. We have lots of fun planned for the boys, and I want them to enjoy their time off. I hope this picture isn't too gory. Little Elvis lost his first tooth on Thursday night. I decided that I would pull it that evening. Little Elvis was nervous, and kept putting off the inevitable. Right before bed, he told me that I could pull after he ate some pear. I should have thought about that, but I didn't. He started eating his pear, and I looked over to find it covered in red. We looked for the tooth, and it was gone. He was so upset about actually losing his first tooth. We told him that we'd write the tooth fairy an IOU. (Although she's not getting that tooth, because I'm not looking for it.) He calmed down, and posed for his picture. The good news is that it didn't hurt. Hopefully, he'll be more willing to let me pull the next tooth. Baby Plum usually hears that he looks just like his mommy. While he may look like me, he's got more of Bob's personality. And he shares his Daddy's interests. He's playing the harmonica and guitar at the same time, just like his Daddy. I think he's looking more and more like his daddy. The other night I was working on something at my parents' house. They watched Baby Plum and Cheese Puff for me. But at 7, Cheese Puff wanted to be back on his schedule. Poor baby doesn't have much of a daytime routine, but we do have a nighttime one. So, I grabbed a screaming child, and headed home. In our hurry, I grabbed my dad's baseball cap. Baby Plum had to try it on. Cheese Puff wasn't as excited about trying on the new headgear. Some sweet pictures of two of our sweet boys. I need to do a better job taking pictures. Baby Plum giving me a sweet smile. He fights me on going to school on the mornings he goes. But he always happily gets out of the car when we get there, and he's always happy when I pick him up. He's back into doing our dancing game in the mornings. And is still really into his puzzles. This little guy must be teething. Oh, I hope he is. He had a fever the other day, and today he pitched some huge fits. I took pictures. He didn't want to be held. He didn't want to not be held. He wanted to eat, but then he would just spit out whatever we handed him. Poor, sweet baby. He was happy this morning, but some switch flipped around 1 this afternoon. Do you like how the cat is checking on him? Slappy has always hated it when the boys cry. She doesn't understand why I don't always stop their cries. Little Elvis had his first play practice last night. He wanted to take his talking Captain America. I said he could, but Captain America couldn't talk during the parent meeting which was held before the read through. It was a busy evening. I had another meeting I was going to try to attend after the parent meeting. The parent meeting ran long (thanks to parents asking stupid questions) and I missed my other meeting. Yay. When I got back, all of the kids were seated on the front two rows to read their lines. I couldn't sit by (re: control) my child. The read through began, and I heard, "I am Captain America!!" Little Elvis little head jerked up, and I made my way over as quickly as I could to get that doll. He said that another boy pushed the button. Since I didn't specifically say that Captain America couldn't talk during the read through, he got the doll back when we got home. We have to be super-specific with Little Elvis. I also thought it was kind of funny. But I'm getting good at not laughing at some of these things. One more thing about my Little Elvis. He told me last week that my tummy looked mushy, so I must be pregnant. He tried to talk to the baby in my tummy. Um, I'm almost back to my pre-Little Elvis pregnancy weight. My pants that day were too big for me. I was all proud of myself, until I heard about my mushy tummy. I guess I need to actually start doing situps. What do you wear on a regular Tuesday afternoon? Baby Plum does like playing with Cheese Puff.... some of the time. They love playing with the garage together. They were so sweet, and were completely ignoring me. Until I brought out the camera, and distracted Cheese Puff. They decided to play with the garage from the couch. Here, Cheese Puff has grabbed a plastic walkie-talkie of Little Elvis'. It's plastic, and does nothing. Here, Baby Plum is taking it away from Cheese Puff, saying, "No. This is Little Elvis' phone." Baby Plum likes to tempt Cheese Puff with Little Elvis' things, and then scold him for playing with them. We have a book that I love called "Cowlick." The boys like it some, but not as much as I do. It's super-cute, and I think the family has 3 little boys. Anyway, Baby Plum had a cute cowlick this week. Can you see it? I think maybe it's trying to curl some. It was hard getting a close up. He moves a lot, and wants to see every picture I take. This little one doesn't get cowlicks yet. He's drooling up a storm, and I assume growing more teeth. As is his big brother. 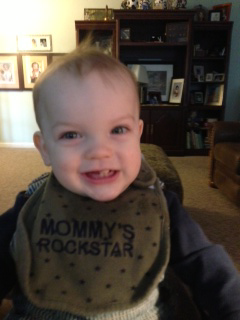 Little Elvis has his first loose tooth. You can kind of see it leaning to the side in this picture. It's one of the bottom middle teeth. He was so scared at first. He cried a lot Wednesday night. I think a collision with Baby Plum caused it to come loose. It was bedtime, and Little Elvis was screaming his head off. Bob finally went to see what the problem was. He heard Little Elvis telling Baby Plum he was going to have to pay. Baby Plum had pulled out his piggy bank, and was attempting to put money from his bank into Little Elvis'. That sweet, sweet little boy. On Thursday morning, I tried to explain to Little Elvis that losing his teeth was a good thing. He finally seemed to accept my answer when I told him that Cheese Puff would look really silly with Mommy-size teeth.